The Protech Tactical Response is a full-size, tactical, button lock automatic that is durable, comfortable, lightweight and fast in the hand. A sub-4 oz. 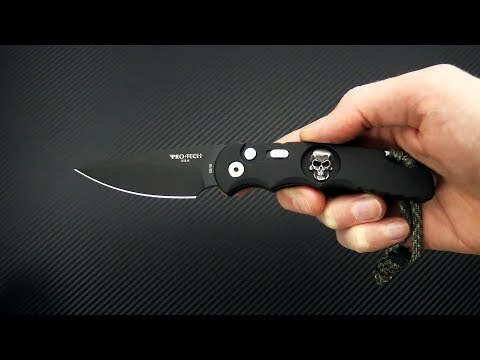 weight makes carry a breeze while the drop point S35VN blade is simple and functional for both utility and martial use. This Limited Edition "Skull" version comes with a black hard anodized aluminum handle with Sterling Skull inlay, Mother of Pearl Button, Custom Skull Lanyard and black DLC coated CPM S35VN Blade. Individually numbered of 300. Blade: CPM S35VN delivers a highly corrosion resistant and durable blade that has very good edge retention. The saber grind delivers good strength while the long top swedge provides a fine point for piercing and detail work. The Diamond-Like Carbon or DLC finish hides wear from use, offers enhanced corrosion resistance and is discreet for use. The blade deploys via the robust, button operated coil spring which delivers fast deployment when the seconds count. A slide safety offers added safety when carrying. Handle: 6061-T6 Anodized aluminum makes the Tactical Response both tough and lightweight with a black hard anodized finish that is durable and non-reflective. Milled finger grooves provide a comfortable and secure grip in the hand with subtle jimping for indexing. A hardened 410 steel backspacer contains a generous lanyard hole and protrudes from the pommel end of the handle for use as an impact tool. The robust button lock provides intuitive operation and secure lockup. This Limited Edition version is elevated with a Mother of Pearl inlaid Button, Custom Skull Lanyard and Bruce Shaw designed Sterling Skull inlay on the handle for a truly custom feel. With only 300 pieces made this is a truly collectible piece. Carries via black DLC coated, stainless steel deep carry pocket clip. Right hand, tip-up only. CPM S35VN: was designed to offer improved toughness over CPM S30V. It is also easier to machine and polish than CPM S30V. The inclusion of Niobium allows for the formation of niobium carbides along with vanadium and chromium carbides. Substituting niobium carbides for some of the vanadium carbides makes CPM S35VN about 15-20% tougher than CPM S30V without any loss of wear resistance. CPM S35VN’s improved toughness gives it better resistance to edge chipping.